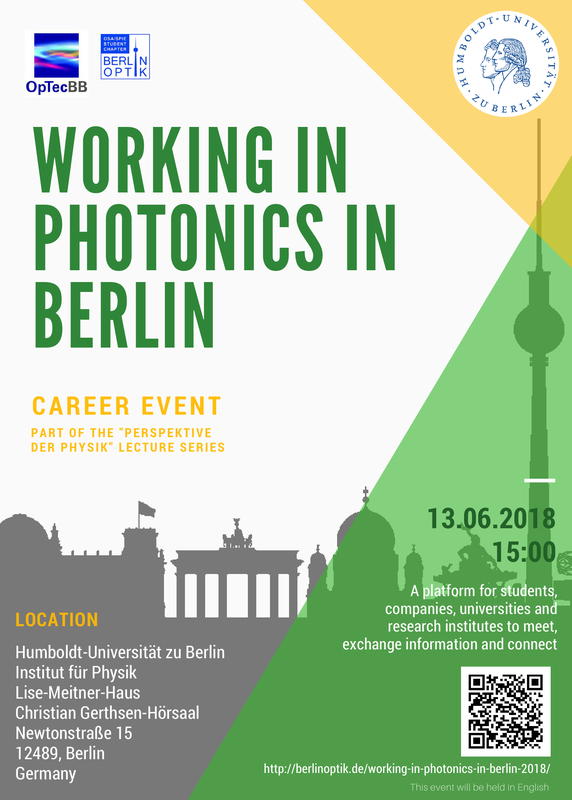 We are a group of students in Berlin, Germany, with an interest in Optical Sciences and Engineering. Founded in February 2008, this group belongs to a worldwide network of student chapters, which are supported by OSA and SPIE. – to promote awareness of Optical Science and Optical Engineering among the academic and local communities. – to serve as means of communication and interaction between students, faculty, and administration. – to establish interaction between students and local sections and national headquarters of OSA and SPIE. – to broaden the students’ insights on post-graduate opportunities. Uniting more than 70,000 professionals from 134 countries, the Optical Society of America (OSA) brings together the global Optics community through its programs and initiatives. Since 1916 OSA has worked to advance the common interests of the field, providing educational resources to the scientists, engineers and business leaders who work in the field by promoting the science of light and the advanced technologies made possible by Optics and Photonics. OSA publications, events, technical groups and programs foster optics knowledge and scientific collaboration among all those with an interest in Optics and Photonics. For more information, visit www.osa.org. SPIE is the international society for Optics and Photonics founded in 1955 to advance light-based technologies. Serving more than 188,000 constituents from 138 countries, the Society advances emerging technologies through interdisciplinary information exchange, continuing education, publications, patent precedent, and career and professional growth. SPIE annually organizes and sponsors approximately 25 major technical forums, exhibitions, and education programs in North America, Europe, Asia, and the South Pacific. For more information, visit www.spie.org. Copyright © 2019 Berlin Optik Student Chapter. All Rights Reserved.